Blue trees: signs of spring? The April 2nd warm weather brought out daffodils, dog walkers, gardeners, bike riders, and blue trees. According to an explanatory bookmark a man handed us at today’s downtown Seattle tree-painting event, “Trees are largely invisible in our busy urban lives. The Blue Tree uses color to alter our perceptions and suggest that something out of the ordinary is happening.” That part makes sense. However, the other stated goal of the tree art is to highlight issues of deforestation and loss of old-growth forests. Blue trees in the city don’t remind me of old-growth forests. However, they are lovely. The painters say they’re using water-soluble paints and that when it rains again (forecast: fifty percent chance after 11 pm tonight) the paint will run down the bark and disappear. They’re going to be surprised. Perhaps my skepticism comes from a bad experience I had when I worked in a school district and permitted a PR firm, which had a contract with the state to run an anti-smoking campaign, to create chalk art messages on three middle-school campuses. They assured me they would use water-soluble chalk. As it turned out, our maintenance department’s chalk removal project lasted longer than the no-smoking messages — which started to mingle together in the rain before any kids saw them — and affected more people. 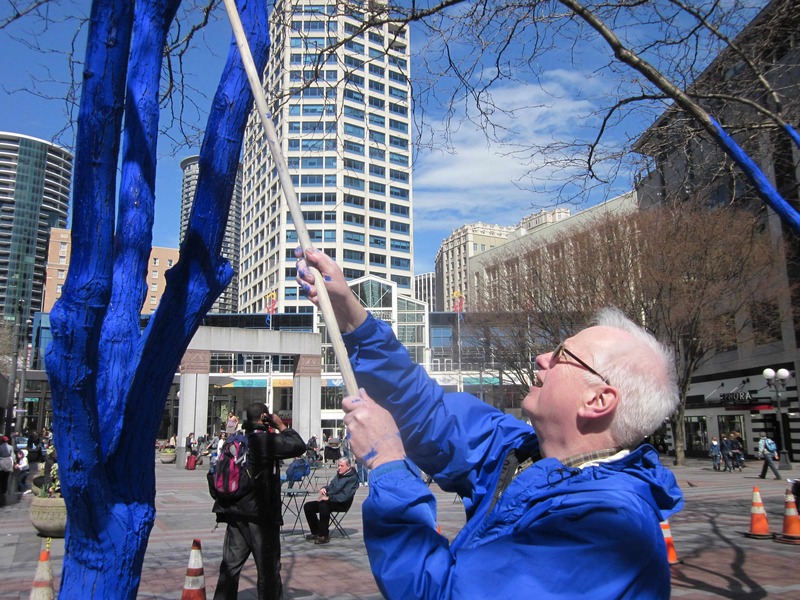 If we can paint trees blue, what will come next? Painting white roses red? Poor Alice comes across playing card gardeners in Wonderland painting white roses red to cover up their planting error. They tell her, “If the Queen was to find it out, we should have all our heads cut off, you know.” Luckily the tree painters will have left long before the dissolving paint turns the shoes blue of people walking through the square in the morning deluge.